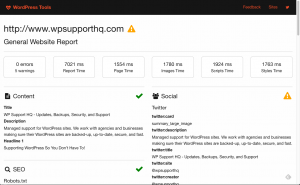 We’re happy to announce two free reports for WordPress websites at http://tools.wpsupporthq.com! The reports are still a work in progress, so please send whatever feedback you have. The first report is a Security Check Report. It looks at some very basic security checks and information. The second report is a General Report that looks for broken links, social media data, and SEO data. We hope you find them helpful and look forward to feedback!